Being involved in any type of auto accident is a frightening experience, but being in a collision with a wrong-way driver can be particularly traumatic. If you've been injured or lost a loved one due to a wrong-way driving accident, you may be eligible for compensation if you act quickly to protect your legal rights. 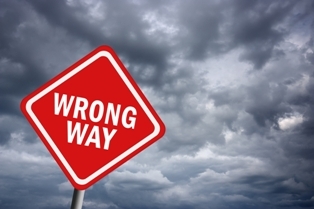 Wrong-way driving refers to any type of movement that goes against the legal flow of traffic. These types of accidents are rare but generally very serious. The driver is an elderly person who has become disoriented and confused. The driver is traveling in an unfamiliar area after dark. The driver entered the highway in the wrong direction, made a U-turn, or used an emergency turnaround. The driver is newly licensed and overlooked the posted signs due to inexperience on the road. The driver is having a medical emergency such as a heart attack or seizure. The National Transportation Safety Board (NTSB) says wrong-way collisions account for about 3 percent of accidents on high speed divided highways, but they are much more likely to be classified as serious or fatal accidents. Estimates vary, but past studies have shown increased fatality rates of 12 to 27 percent compared to other types of accidents not involving a wrong-way driver. On average, about 360 people lose their lives in wrong-way collisions each year. The majority of accidents involving a wrong-way driver are head-on collisions. Head-on collisions are the most dangerous type of traffic accident because the force of the impact is doubled due to the speed of each vehicle. When the impact is doubled, occupants run a higher risk of broken bones, head injuries, and other serious conditions. Head-on collisions account for about 10 percent of all accident deaths even though they make up just 2 percent of all traffic accidents. Over the years, state and federal officials have tried a variety of measures to reduce the rate of wrong-way collisions. Some of these include improved driver education, enhanced road signage, road barriers, and evaluations of driver behavior using hidden cameras. Medical expenses. You can be reimbursed for hospital stays, surgeries, follow-up visits, medication, and rehabilitative therapy. If you'll need ongoing medical care, the at-fault driver can be held responsible for this cost, as well. Lost wages. If you’re injured, you’ll likely need time off work. You can seek reimbursement for lost wages as well as any applicable reduction in your future earning potential. Pain and suffering. This category of damages refers to the physical and emotional trauma of being injured due to the negligence of the at-fault driver. If you've lost a loved one due to a wrong-way driving accident, you can seek compensation for medical expenses up to the time of death, funeral costs, loss of income to support your family, and pain and suffering. The laws regarding personal injury and wrongful death settlements can be very complex, which is why the best way to protect your legal rights is to hire a qualified attorney to advocate for your needs. These types of cases are accepted on a contingency fee basis, which means your attorney receives a portion of the settlement as payment for his legal fees. A contingency fee arrangement allows you access to top-quality representation with no up-front expense and gives your attorney a financial incentive to negotiate for the largest settlement allowable by law.